JINHAE, Republic of Korea - The 30th Naval Construction Regiment (30 NCR) is working hand-in-hand with Republic of Korea (ROK) Seabees for exercise Foal Eagle. The regiment is forward deployed to provide command and control for Naval Mobile Construction Battalions (NMCB) 4, NMCB 133, and Underwater Construction Team (UCT) 2. "30 NCR is participating in Foal Eagle to exercise our readiness to respond to contingencies and continue to build our strong partnership with our ROK counterparts," said Capt. James Meyer, commodore, 30 NCR. "The exercise is a great opportunity to demonstrate our support to the Republic of Korea as well as our resolve to security and stability in the Region." The exercise will test the regiment's operational abilities to include embark, logistics, communications, and engineering and construction outside of a stateside training environment, Meyer added. Operations throughout the exercise will see Naval Construction Force Units working directly with their ROK counterparts to demonstrate their capabilities in major combat operations, humanitarian assistance and disaster relief, theatre security cooperation, and construction readiness operations. UCT 2 will join a ROK Underwater Construction Team and other divers to construct a concrete wharf, execute underwater cutting, welding, and pier inspection training, conduct pier inspections and harbor surveys in Jinhae, and other underwater construction training. 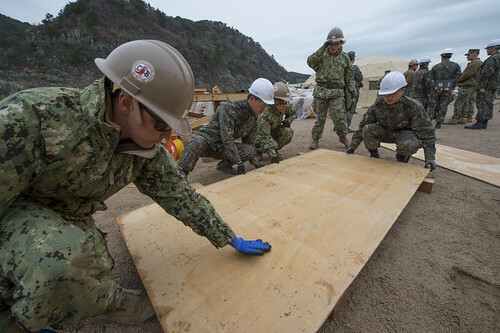 "The Korean Seabees are trying to build up an underwater construction team so, every time we come out here we show them something new that is involved with underwater construction," said Lt. Joshua Baker, executive officer of UCT 2. "Last year we showed them underwater concrete pours and how to do pile wraps, and this year we're doing coordinated crane operations with divers in the water placing blocks." NMCB 4, working hand-in-hand with ROK engineering forces, is conducting road and port surveys and horizontal road construction on Yokjido Island. NMCB 133, together with their ROK Seabee counterparts in Busan, are erecting tents, Southwest Asia Huts, observation towers, material yards, and bunkers. "The relationship between the U.S. and ROK Seabees is extremely strong and continues to grow," said Meyer. "The close relationship between our countries' Seabees creates great synergies, improving our interoperability, and readiness to respond to any crisis." Foal Eagle 2016 is a combined field training exercise conducted annually by the ROK armed forces and the U.S. Armed Forces with the support of the Combined Forces Command. One of the largest military exercises in the world, it is defensive in nature and provides tactical level units the opportunity to confirm force deployment readiness, capabilities, validate interoperability and familiarize forces with the environment. Commander, 30th NCR provides operational control over naval engineering forces throughout the Pacific, Southwest Asia and the western United States in response to combat commander and naval component commander requirements. They serve an integral part of the Naval Construction Force and accomplish major combat operations, theater security cooperation, humanitarian assistance, disaster recovery and Phase Zero requirements across the Pacific area of responsibility.